Striker Sammy Morrow admits he's enjoying his football at Institute. Striker Sammy Morrow admits he would love to open his goalscoring account for Institute this weekend against his old club Linfield. The Limavady man, who spent a season with the Windsor Park men is really looking forward to Saturday’s Irish Cup clash at Drumahoe, conceded he would sacrifice scoring if he could guarantee Kevin Deery’s side would cause a massive shock. “There’s times football presents themselves with opportunities like this,” he said. Morrow, who was part of the last Blues side which played at Drumahoe in March 2015 and saw the Belfast men win 1-0 thanks to Aaron Burns’ goal, knows he and his team-mates are going to be up against it, but he also admits a cup upset could reignite there entire season. “Linfield are coming in great form and they are the biggest team in the country, so it’s always going to be a tough task,” he added. Football at times presents you with opportunities and it’s up to you to go and grab them with both hands. “But it’s a cup tie, a one off game and anything can happen in cup ties. “Look as I said football at times presents you with opportunities and it’s up to you to go and grab them with both hands. 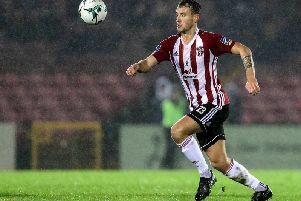 The 31-year-old has played a few games for the Waterside men since his January move from Coleraine and he’s happy to get a consistent run of games and hopes his form and link-up play with his new team-mates will improve over time. “I’m enjoying my football and I have got two or three 90 minutes’ under my belt and hopefully I can start against Linfield and that we can give a good account of ourselves,” he said. A few weeks ago the Blues had Stute watched in their 1-0 defeat at the PSNI and Morrow is happy that was the game they send their scout too, as truth be told it was somewhat of a terrible display by the Drumahoe side at Newforge. “Linfield as expected did their due diligence, but it’s actually not a bad thing that they came and watched us against the PSNI, because we didn’t play well at all, so it might be a blessing,” he joked.